: Aloha from the Garden Island. Our home and lower floor studio is located in Hanalei on the North Shore of Kauai and is only a 60 minute drive from the Lihue Airport This spacious lower floor studio is situated just footsteps (100yds)to the beautiful Hanalei Bay. (Minute Walk to the parking lot and beach) Its an older home but unit is kept in a neat clean condition.Locally born and raised residents .We have lived on Kauai all of our lives.We look forward to meeting you all. .Compare Others Near the Bay and You'll find out how reasonable this rental unit is priced. Last Minute opens available for September, October and December Aloha and Mahalo. The slow pace of Hanalei Bay ranked #3 in the top 10 beaches in the nation on Kauai’s north shore makes this two-mile (three-kilometer) long, half-moon beach at the foot of emerald mountains and glittering waterfalls the perfect place to stop and soak up the sun. Beachgoers can swim, bodyboard, and learn to surf in summer’s calmer waters. In the town of Hanalei, a five-minute walk from the beach and a throwback to old Hawaii, you’ll find surf stores, gift shops, with a variety of restaurants casual eateries, a grocery store, post office, fish market, farmer's market, art gallery, a beauty salon and kids selling fresh leis on the street corner. Horseback riding, helicopter sightseeing, tennis,and golf at world-renowned Princeville Golf Course are all within minutes of Hanalei Town. Bus Service nearby is available 7 days a week and runs every hour from 5 a.m-6 p.m.can take you from one end of the island to another. This simple,clean and affordable self-contained lower floor guest studio has a private entrance and a partial view of the mountains with it's cascading waterfalls. Our home and guest studio is nothing fancy but provides most amenities needed for a comfortable stay. It has an outdoor lanai with a barbecue gas grill and side burner for outdoor cooking.The kitchenette has a refrigerator and a microwave for light cooking so you can dine in and save $.It is at an ideal location for first-time visitors to Kauai or travelers on a limited budget. Perfect for a couple or a small family visiting our beautiful island. Awesome location for surfers during the winter months, perfect for families in the summer. Coolers, beach towels, mats, sand chairs are provided. All bookings require a security deposit of $125.00-$200 and will be returned within 14 days after the unit has been cleaned out and checked. Come share the Aloha spirit with us!. Aloha! Reservations must be paid in full 45 prior to check in. A minimum $150.00-$200.00 security deposit is required to confirm all reservations. It is required 7 days after the booking is made. This deposit is separate from the rent, which will be refunded by mail within 14 days after your departure. Deducted from the deposit will be any missing items, late checkout fees, loss of keys, extra cleaning or damages that exceed normal wear and tear.$65.00 lost key and entry lock change fee. Notification of cancellation must be received 45 days prior to arrival. All cancellations are subject to a $125.-$200 cancellation fee from the beginning of the deposit paid. Cancellations less than the 45 days will result in forfeiture of full deposit and monies already paid. Guest is responsible for the entire time booked. No rental refunds are given for early departure, late cancellations or bad weather. A fee of $100.00 for single/double occupancy, $120.00 for Three, and $140.00 four.Cleaning fees will be added to total rental charges after the taxes. We expect the unit to be left in a “neat” condition prior to your departure. A professional cleaning person will come in to clean and prepare for the next check in arrival. Extra charges will be assessed from the deposit if there is extra cleaning done after your departure from the unit or anything is found damaged or missing. *Late checkouts will be result in a $20. Per hr. late checkout fee from the deposit if the cleaner has to wait after 10:00 a.m. unless prior permission has been given. We will be flexible but will charge if necessary. Checking in should be anytime after 3p. If for some reason you will be arriving later in the evening please let us know so we can leave a light on prior to your arrival. Unless prior arrangements have been made, check out is by 10:00am Cleaning person will be here by 10:00 a.m. so that she will have ample time to clean unit before next check in arrives. If something has been broken please replace it or if lost kindly inform us before checking out or leave a note with payment to us.Check your trunks for towels, boogie boards, mats and other stuff you may have taken out of the rental and may forget to return. Keywords: Discounted Rates for dates listed above, Lowest Price Northshore for Summer Months. Minimum 3 nights. Walk to beach sun and surf. Simple, Nothing Fancy, Clean Affordable Studio, great location for families, couples who are on a budget. 550sq. spacious living.Minute walk to beach watch romantic sunsets, summer surf, waterfalls, walk or bike to town, grocery store, farmers market, shopping, fish market, churches and dining all within walking distance. We love families with children. Local Family Owners We have lived on Kauai all of our lives. We are one of the few still trying to keep our home that we have raised our family born and raised here on Kauai. Due to the rising cost of land taxes and house insurance we opened our home at a reasonable cost to visitors from all over the world We have a repor with many who come back each year to vacation in this simple spacious studio only footsteps to the bay. Come visit us in Hanalei and see for yourself the true meaning of Aloha spirit with local people who will share their stories of the good old days and how the island has changed over the years. What are you waiting for? Aloha..
We are local born lived on Kauai all of our lives.Great location near shopping, farmers market, fish market and restaurants and bars near by. Walking distance to town, churches, surfing, boating and lots more. Minute walk to the beach. 10 minutes to Island Kauai bus service. There is a indoor shower/bathroom and an outdoor shower outside to rinse sand off from the beach before entering the unit. Beautiful Mountain views with cascading waterfalls and majestic rainbows. View from the front yard. See the ocean from our yard. Hear the waves crashing on the shore from the unit at night. Moonlight walks, Surf just footsteps away, Romantic 1-2 walk from the unit to Hanalei Bay. Great location. Hot water for morning and evening showers. Runs by solar panel. Outdoor washer, with outdoor clothes line only. No Dryer Use.must purchase own soap. Gas Grill on the cover lanai area has a gas side burner You can use pots on shelf inside to cook using the gas side burner.Rule Both Gas switches and propane tank Must be turned off when completed. Inside the unit seats 4 and outside on the lanai area table with 4 chairs along with a barbecue gas grill with side burner for light cooking . there is a smail yard outside. Outdoor lanai and sitting area with a barbecue gas grill Coolers, boogie boards, sand chairs, mats and sand toys available. some boogie boards, sand chairs,.. limited. Great Location for visitors on a budget, surfers or families wanting to be near the beach and town.Family atmosphere. Awesome sunsets, surf and mountain waterfall views. Rainbows. Aloha with a smile.. Locally owned born and raised here on Kauai. We love our island and our ohana. the space had everything we needed. The garden was beautiful and we loved all the little lizards enjoying it too. We’ll be staying again for sure. Awesome place so close to beach. Clean with friendly hosts. Great for our family of four. Good location, clean, an easy walk into town. Well located property for the beach and town. Really for two only as convertible couch is poor. Not suitable for extensive cooking as unit doesn’t have a regular stove. Owners friends and very helpful. A great vacation location. What an amazing location! 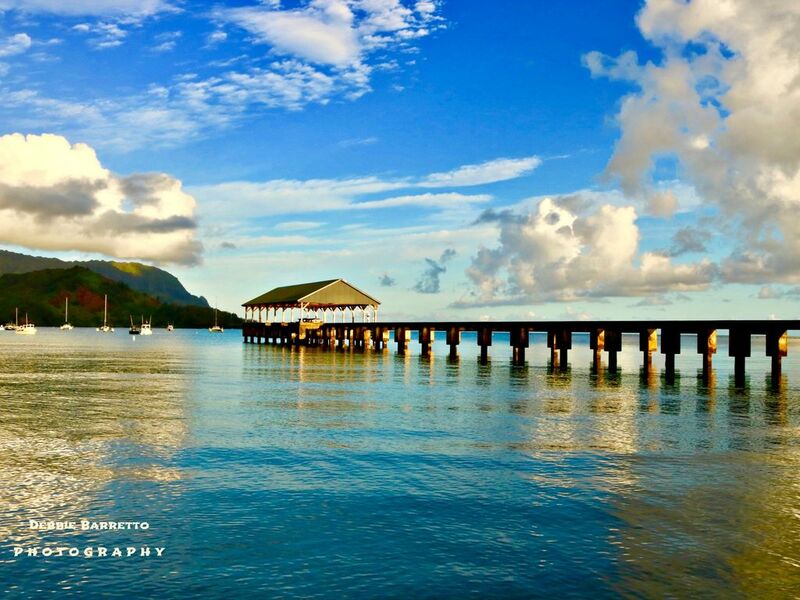 Only a 50 yard walk to the beach and a quick 10 minute stroll to downtown Hanalei. Though we explored the entire island of Kauai during our two-week stay, we were always happy to come back to this perfect studio apartment at night. Debbie and Lloyd were great and made sure we had everything we needed. We really enjoyed grilling local fish and veggies on the grill and relaxing on the lanai after a long day of surfing and hiking around the island. We enjoyed our stay, Debbie was very friendly and accommodating. We had everything we needed and loved being able to walk to the beach and to town. We hope to visit again! Thanks Debbie!! My Girlfriend and I had a wonderful stay here for 3 nights, wish we could have stayed more. The location is perfect, its only a few steeps to the amazing beach, and walking distance to town. The facilities were everything we needed and more, with lots of beach stuff to use like chairs towels umbrellas etc.. and bicycles for cruising around town. Debbie was very nice and after we met and briefly talked when we arrived we were given total privacy. we would definitely stay again!